"...the overall times recorded by War Command, Al Thakira and Kingston Hill look pretty good compared to what might be expected of horses winning their races in the way they did." 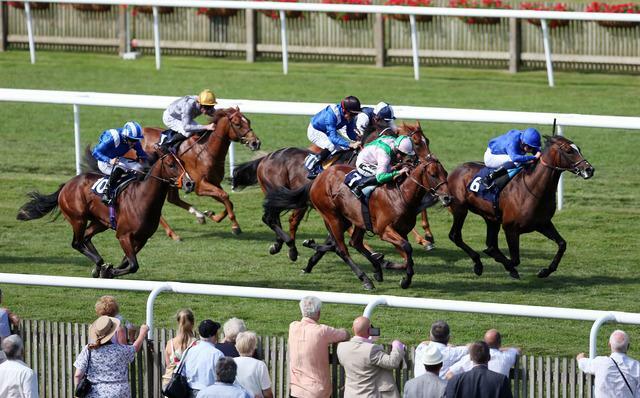 The provision of electronic sectional times at Newmarket's Future Champions Day enables us to establish how the races were run and whether or not individual horses in those races were advantaged or disadvantaged. Those sectionals have been provided by TurfTrax, and the usual caveats apply regarding accuracy. The following figures are for the individual winners of the races, rather than the leaders as is customary in other circumstances. What the figures identify is that none of the winners ran especially far from par, as identified by the mark-ups, which result from the difference between the actual finishing speed %s and optimum finishing speed %s. What's more, few of the close-up beaten horses ran especially inefficiently, either. Boring though it may be, what you see is (largely) what you get where the 2013 Future Champions Day is concerned: the results and the overall times tell you much of what you want to know. To give a bit more depth, the overall times recorded by War Command, Al Thakira and Kingston Hill look pretty good compared to what might be expected of horses winning their races in the way they did. War Command ran remarkably efficiently after a slowish opening 1f - posting successive furlongs of 14.99s, 11.29s, 11.31s, 11.37s, 11.52s, 11.48s and 13.10s over the undulating 7f - in taking the Group 1 Dewhurst Stakes, and in the process forced his rivals into slightly slower-than-par finishes. Al Thakira's win in the Group 2 Rockfel Stakes is more intriguing from a sectional point of view. Her by-furlong sectionals were 14.65s, 11.24s, 11.30s, 11.58s, 11.44s, 11.78s and 13.55s, showing that she went quicker than War Command (who is a better horse) through the first three and the fifth furlongs and that she predictably paid for this in the last two furlongs. Interestingly, though, her rivals paid even more, coming home slower still. As mentioned, the overall time is useful, but the sectionals suggest the margins were strung out somewhat by the run of the race. By way of comparison, the smart older filly Fiesolana recorded the following sectionals in taking the Group 2 Challenge Stakes at the same distance: 14.44s, 11.22s, 11.38s, 11.45s, 11.58s, 11.54s, 12.63s, coming home fractionally quicker than par. The juvenile colts which chased home Kingston Hill in the Gr3 Autumn Stakes had no excuses in sectional terms, and the winner's closing furlongs of 11.60s, 11.67s and 13.10s identify him as at least a length better than the result. Given that this was only Kingston Hill's second run, and that he accounted for 111-rated Oklahoma City by two lengths, he looks a contender for good prizes hereafter. Fiesolana was responsible for the fastest final 1f and fastest final 2f on the card, but the three fastest final 3f came in the Group 1 Middle Park Stakes, with runner-up Hot Streak fastest of all at 35.53s. The winner Astaire, who made nearly all, was not flattered according to the sectionals, but anyone who supported Hot Streak is entitled to wonder whether that horse might have won under faster conditions. Hot Streak, who had posted exceptional sectionals at Ascot the week before, quickened sharply to dispute the lead 1f out (penultimate 1f of 11.20s) then flattened out near the line. Granted normal progress, Hot Streak could even be challenging for Champion Sprinter status in 2014.